If you pop tall out of the previous turn, even if you are able to create a top of the new turn like below, you are inclining into the new turn and then have to wait to build angulation gradually, as your hips move lower and catch up with your shoulders. It is slower to initiate because it's based on your body "falling" into the turn. This is an issue in direct relation to how short the turns are - the shorter the turns (SL) the less time you have to wait for the body to "drop"! Also, on ice, the hips will interfere with finding a grip early. On the other hand, if you came out of a retraction release, your hips are lower already and then you extend the outside leg, you essentially create angles and angulation from the lower body. We could also use this to think of counterbalancing as a holistic movement to counter-balance rather than solely an upper body movement, although it is obvious that even in the image below, the upper body works a lot to maintain the "stable" appearance. Also, there are two steps to angulation: one is creating it and one is using it. 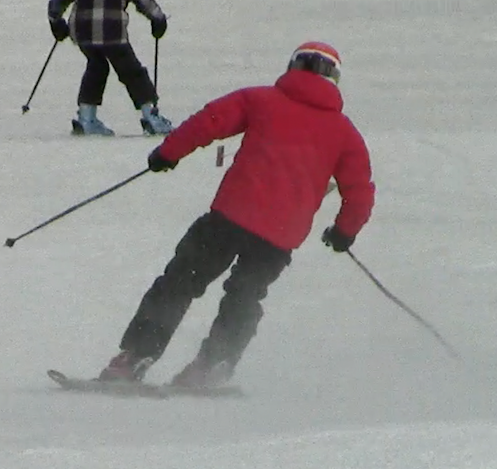 Most people rush and do both at the same time, while high level skiers can have the patience and time to build it and THEN use it or make it effective by muscle contraction, as needed. In motorcycle racing is known that the actual act of inclining the motorcycle into the new turn reduces traction at the wheels - this is because the action of inclining the bike is essentially a rotation around the center of mass of the bike and if the saddle goes down, the opposite end of the bike, the wheels, are actually leveraged up. They don't actually come up fully off the ground because the bike is quite heavy, but the weight is reduced and good racers, at speed, flicking their bikes are aware of this effect. 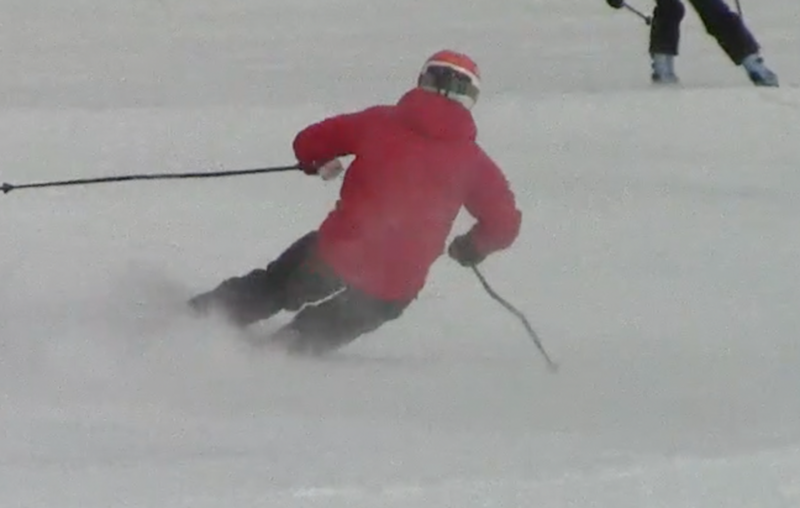 This same mechanism applies to skiing: in a turn started with inclination from an extended stance, the act of inclining reduces weight on the edges that are about to engage. This is another reason why we consider it better to strive to start most turns from a lower stance and develop angulation early. Here is another point of view: Incline to win. Viewed 2631 times ( | Print ) this page.